Assyria is perhaps the unique example of a state that revived itself in the early Iron Age, which actually had writing. The case for revival might be a bit weak, were it not for Ashurnasirpal renovating Kalhu (Nimrud) as a capital, building a palace there and decorating it with the "Standard Inscription" that celebrates his rule: State, city, text. More than anyone else can say, the Zhou excepted. In either case, it is hard to see the demand for horses having a knock-on effect as far as Britain, the other place I'm going to be looking at today. 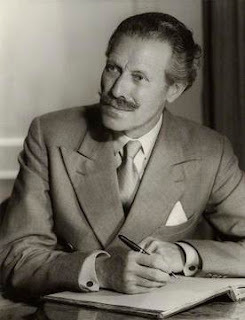 The case for equestrian skills is a bit vaguer, in that a particularly delicious letter from an administrator to Sargon informs him, exasperatedly, that th the governor has been able to round up 500 horses for the army, but only 50 men. "What do I do know?" He asks. Assuming, as seems likely, that the horses are unbroken, it's a good question, for me, as it is for Sargon. What's it telling us? That Sargon was rich; that he had the resources and political buy-in to build Dur-Sharrukin; that he had to draw on the horse-rearing capabilities of large areas; that his ability to access western Mediterranean trade goods via the overland routes through Anatolia and Phoenicia was important to his success. More on that later! But there is also the ideological component. What made Assyrian ideas congenial? What made people willing to listen to smiths and horse trainers from afar? 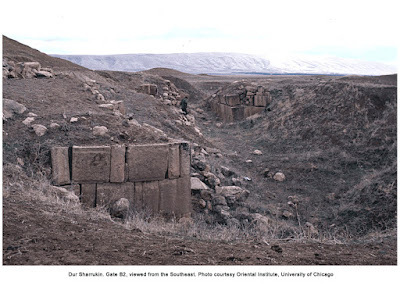 It is a fact that Assyria's ancient wisdom, its insights into extipiscy and divining were rooted in ancient oracles. Enigmatic messages out of deepest antiquity are sent by the gods to help us think through the mysteries of their will. Suppose you examined the liver of a sacrificial animal and found the"Omen of Sargon, who took earth from the courtyard of the . . . gate and built a city [op]posite Agade and called its name ["Babylon,"] and settled  within it." In Babylon, this is read as an unfavourable omen, reflecting Sargon's hubris. That is not, however, the only way that it can be read. Benjamin Foster describes the "oddest" of the Mari exstiptal models as a simple circle with seven notches around it. Unfortunately for someone who wants to take a leap in the dark and see the liver as some kind of divine model of a city, it is an omen of Naram-Sin related to the inhabitants of Apisal. 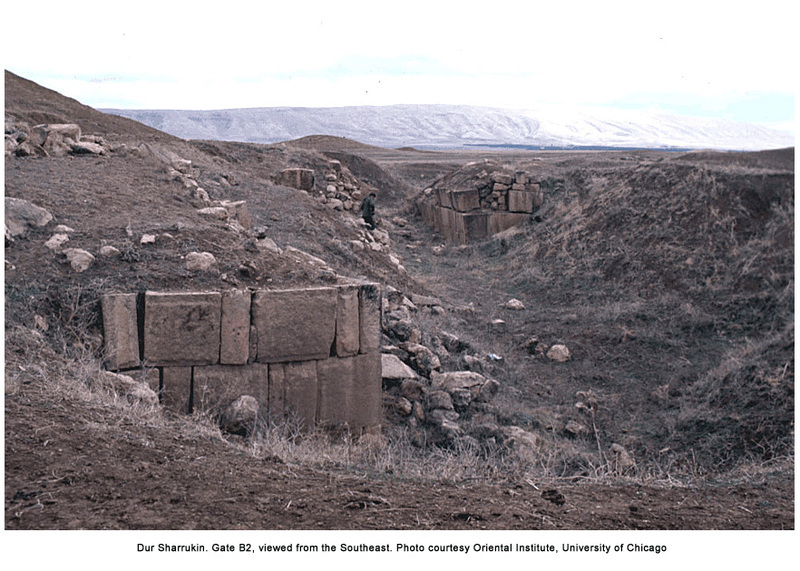 Naram-Sin is a later Akkadian king not known for building possibly-blasphemous cities. (He did have to survive a zombie apocalypse, though. So that's cool.) He is, however, known for taking the city of Apisal by a breach, which the omen text ingeniously conflates with perforations in the liver, a diagnostic sign for the haruspice. WTF, I'll go all in. Universe: liver: city. The perimeter of the city is the surface of the liver: perforations, breaches, gates. This, it happens, is "Gate B2" of Dur-Sharrukin. I haven't been able to find out, and perhaps we do not know, to which god it was dedicated; but, well, it's a "breach" in the seven-gated city. We don't know, and will probably never know, how Sargon meant us to read it, but that doesn't change the fact that it was meant to be read. The city is the universe. I'm repeating myself, I know. "City establishments" are a powerful idea in regions where the cities actually had to be established, where the state really was being built on virgin soil. The problem here is to ground wispy claims about ideologies and knowledge transfer in empirical evidence. British hillforts first appeared in the Early Iron Age. They may be a well-worn subject, but there's just so much information available about them that they are well worth a look here. Sargon built a city where no city should be. That's why we have so much text from him. Thank you, Sargon! Hillforts are, similarly, in dumb locations. Yes, there is security to consider, not only against people, but against flooding. Even drainage is better; but people are going to get tired of carrying water up the slope every day. That's why they've been mostly abandoned. They contain no texts, because there were no texts, but archaeology can make that up, to some extent. Because it has been abandoned, Maiden Castle is a spectacular ruin. No-one lives there, anymore. It's why two of the most significant excavation campaigns in British archaeological history have been launched against the site. We can excavate it! Maiden Castle. So-called either because it is so strong as to be untakeable, which seems a bit of a stretch, or because there was a fashion for naming prehistoric hillforts, "Maiden Castle," at some point back in the day. Calling it "Dorchester," its most plausible ancient name, at a huge stretch of the word "plausible," would just be confusing. It is in a prominent and magnificent setting, and is close to Dorchester, the county town of Dorset. Like its greatest modern excavator, it is famous, photographs well, and aches to tell us more than we can, probably, scientifically, know. Since all of this makes it a bit of cliche of "hillfort studies," I might have reason for avoiding it, if only I had not spent my last weekend pursuing some quality goofing-off, as opposed to going to the library. Had I gone to the library, I woul d have in hand Denis Harding's 2013 monograph and Barry Cunliffe's report on Danebury. By the time that Maiden Castle and Danebury were built, the Neo-Assyrian Empire was sixty years dead, Sargon one-hundred-fifty years past. I'm relying heavily on slow diffusion, here, but it will not escape attention that endogenous factors are at work. From the familiar patterns, this could be a map of a million prehistoric British things, but, in this case, it's all the hillforts. 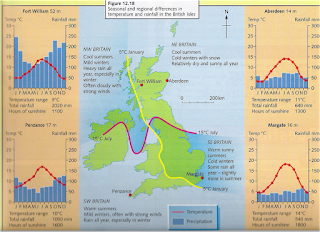 It's still probably not a coincidence that it replicates language distributions, Roman military versus civil provinces, or even mtDNA distributions, and it is probably not a coincidence because of the approximate correlation with the high/less high precipitation isohyet that divides the island of Britain's eastern lowlands from its northern and westerly side. And here's a quick capture of hillforts in the hinterland of the Solent and Pool Harbour. The traditional explanation of hillforts is that they represent the central locations ("tribal capitals") of small, emergent peer polities. Arguments may be had over whether these central locations are signs of the emergence of social hierarchy, or, on the other hand, a particularly unstable period. More difficult to deal with are arguments that apparent regularities are just that, that many of these fortifications are not central places, or are not fortifications. Generalisations are always dangerous, which is why it is good to be able to dive into the most detailed possible study of a specific location and learnwhat that particular place can tell us. Hence, Maiden Castle, which, unless I clipped too short, is one of the orange dots off to the lower left. This is what the area around Maiden Castle looked like in the age of grass. Here's two more, sketch maps showing finds of worked stone ("lithics") and pottery. The neighbourhood, and the places where people didn't go that much are very clearly delineated, and map well onto the late eighteenth century manor of Fordington. This is what I get when I tell Google Maps to show me the way from downtown Dorchester to Maiden Castle. I think that it's safe to say that land usage patterns have changed since the Neolithic! Poundbury, labelled at top, is a continuously occupied site with a history going back to the Mesolithic. 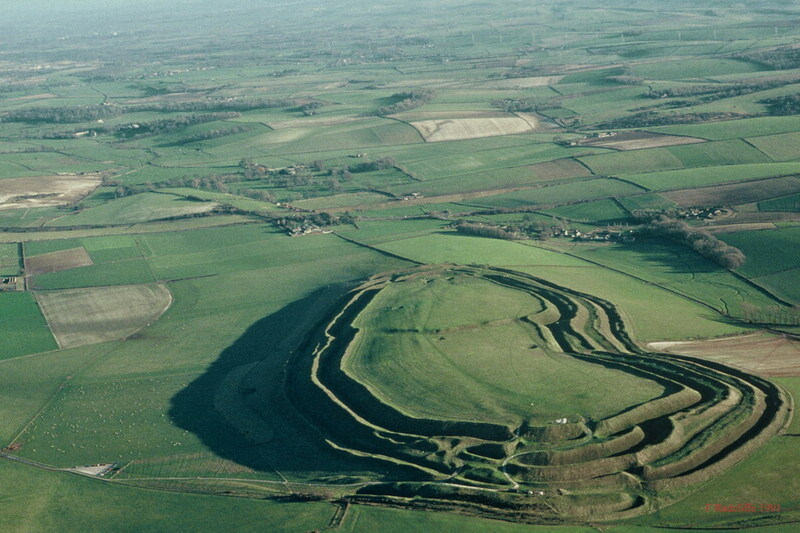 It was refurbished as a hillfort about two centuries after Maiden Castle, and rebuilt as a new city, reflecting the personal cosmology of the current heir to the British throne in the 1990s, although the hillfort proper was spared that project, as well as an earlier attempted cosmic reordering in the 1850s, although the stunning lack of NIMBYism under the Roman Empire allowed an earlier inversion of the natural order of earth over water, demonstrating imperium without end. Poundbury is where people lived when they were being Neolithic and Bronze Agers, instead of Iron Agers. Wheeler did, however, find a Neolithic site underneath Maiden Castle. It turns out that Neolithic people cleared the hill, farmed it extensively, and built a causewayed enclosure as a fixture for their incomprehensible habit of digging up ditches and putting significant things in them. The site does not, however, appear to have been heavily populated, and was abandoned, presumably when the soil fertility was exhausted. An odd barrow was set up, apparently intended to be maximally visible from Poundbury, and the hilltop left to itself, perhaps for as long as a thousand years, by which time it was densely wooded with a climax oak forest. Or you can do without. The next reconstruction of Maiden Castle ripped out the box ramparts in favour of classic glacis fortification with higher ramparts and deeper ditches. At the same time, the earlier arrangement, with opposing east and west entrances like this one, was replaced by a single entrance, framed by outlying hornworks to create an "extended liminal space." Cunliffe supposes, speaking of Danebury, that this reflects a society moving away from an earlier commitment to processionals, to one more interested in controlling access. In this story, it is about an emerging elite. It's hard to argue --he is the expert-- but one is also interested in the ideological aspects of this, and I strain at the leash to apply Baruch Halpern's analysis and talk about the dissociation of the solar cult from chthonic, and emergence of the planetary gods. Of course, I don't have a scintilla of evidence for any such claim, and while I recognise a tone of old-fartness in Harding's disparaging comments about the new generation of prehistorians attempting to read ancient minds, I have to concede the point. We just don't know. Given how general the trend to reducing the opposite-entrance scheme to single was, it looks like some kind of major social change. It was probably reflected in changing ideas about the world, and, if we want to be fancy, we can talk about "cosmology." But. . . So that's where it's good to be a historian of technology, and point out that that's a lot of wood, and a lot of nails. Paul Wells, "The Iron Age." in European Prehistory: A Survey. Marunas Sauskas, ed. 2011. So photo credit to Paul Wells. I am not surprised in the least that it is the great Paul Wells who actually cares about Iron Age nails. Link to Kelheim/Alcimoennis for your convenience. 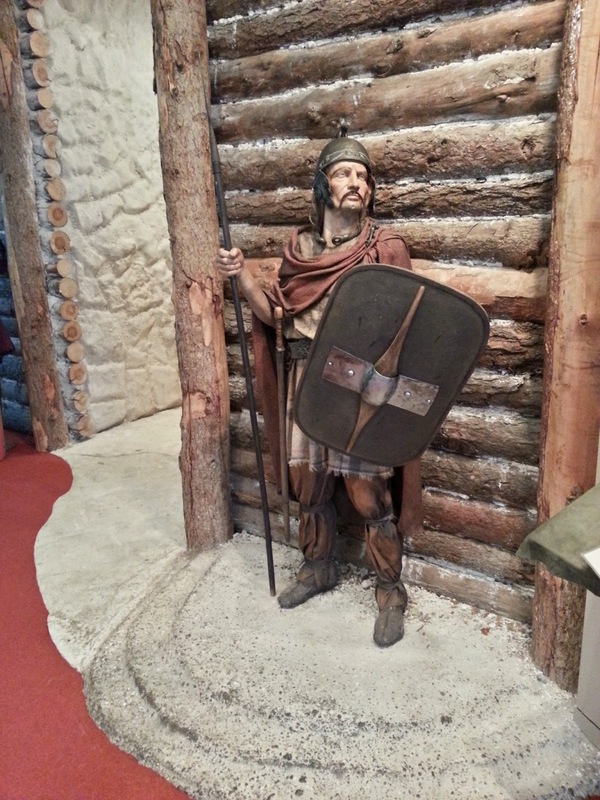 That said, they were probably not used extravagantly --nothing like the Inchtuthil hoard of seven tons of iron nails, stripped from the abandoned Roman fort in Scotland about 90AD [pdf]. The timber, on the other hand, you could make a case for being an expedient resource. To first create a coppice wood, you have to cut the mature trees down and do something with them. The trees that flourished on the castle site itself had to be removed down to to the stump, but the archaeobotanical evidence for a coppice wood in close vicinity is strong. ii) The individual round houses are extremely diverse in design, arguably showing a multi-cultural, conglomerate community familiar from the Jesuit Relations accounts of Indian towns like Kaskaskia, undergoing ethnogenesis as Durotiges. 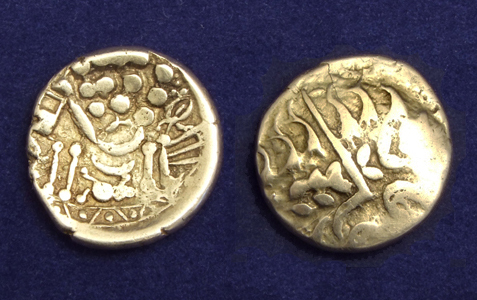 Numismatic enthusiast Chris Rudd summarises Barry Cunliffe as characterising the Durotiges as a wealthy, seafaring people from about 150BC to 50BC, and a poor, retrenching, isolated people from 50BC to the Roman Conquest. I think that this is deduced from the quality and distribution of this coinage, which was of gold prior to 50BC, and silver, thereafter. The name is translated as "Dwellers by the Water," or Water-Rat Kings." 150BC is four centuries after the initial construction of Maiden Castle, but the central importance of cross-channel connections versus interactions within Britain may hold for this earlier period. iii) A central enclosure has now been discovered, strengthening the case for an elite occupation. The Durotiges may not have minted coins with kings' names on them, but that doesn't mean that they did not have a king. So much for speculation. We are on firmer ground with respect to the numerous, clay-lined storage pits found on site. These would appear to be underground granaries, and given that it is best not to open these more than once, the varying individual sizes and shapes of the recovered pits argues for different "denominations" of grain storage. I'm attracted to the idea that they represent some kind of precursor to money, which is why I slip in "denomination," but the Project contents itself to pointing out that different occasions will require different amounts of grain; and, for that matter, one may have different amounts of grain to store on different occasions for supply reasons. That said, it is the image of a group breaking open a pre-specified granary to dole out an agreed-upon amount of grain to celebrate a given festival that leads me to the analogy with money. 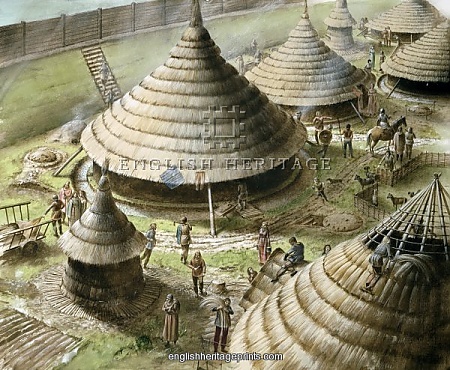 Reconstructed Maiden Castle scene, drawn by Paul Birkbeck and owned by English Heritage, although posted on Pinterest here. 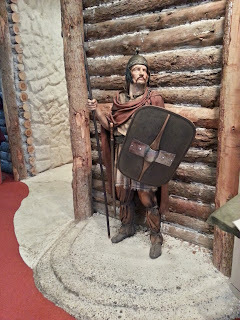 The original seems to be on a sign posted at the visitor's centre at Maiden Castle. Festivals mean food, and food at Maiden Castle was 66% sheep, 15% cattle, 9% hogs, 5% or so horses and dogs. The residual of roe deer and fish is, as usual, much lower than expected. A trend towards increasing number of sheep at the expense of cattle is detected. Bone details support theories about sheep being kept for wool (and lamb) production; and for horses being raised cayuse style, left to range wild and then collected and broken at mature ages. This would indicate that Early Iron Age society wasn't up to breeding for size, and the riding horses of Old England would have been small. But that's okay, because the same can be said for the Assyrian cavalry. Grain production at Maiden Castle shifted from emmer to spelt wheat at the beginning of the Iron Age. The Project has a hilarious juxtaposition of quotes from "experts" indicating that emmer wheat is either especially suited to dry or wet soils, which underlines what I've come to suspect about people who weigh in on earliest agricultural practices, which is that no-one has actually done the work of figuring out why particular grains were favoured in earliest antiquity before jumping in to offer opinions. That being said, the shift to spelt wheat probably supports other archaeobotanical evidence for more intensive use of the wet valley bottom of the Fome river. There are also changes in the choice of barley varieties, Brassica, in all its varieties from cabbage to brussel sprouts, and considerable evidence of chernopods as a subsistence crop (again, plants suitable for intensive cultivation in wetlands, dropping out of modern agricultural practice prior to quinoa becoming cool). So, in short, more intensive use of wetlands, preparatory to the jump over from Maiden Castle to Dorchester. The risk in a project like this is that one forces the empirical evidence into a preconceived interpretation. The empirical evidence broadly supportive of the general thesis, the better. Modern work on British hillforts is important because the phenomena is a signature element of the Early Iron Age. It is almost intuitive that they would tell a story of woodland clearance/management, more intensive use of wetlands, and speak, however obliquely, of population increase. The sheer profligacy with which these early sites are thrown around the landscape speaks to the widespread nature of the Sacred Spring moment. There were a lot of new communities being created in this period, and they did not all last through the subsequent period of consolidation. As for the causes of the phenomena, the closest one comes to a clearer picture is the unexpected emergence of familiar, climate-linked patterns. 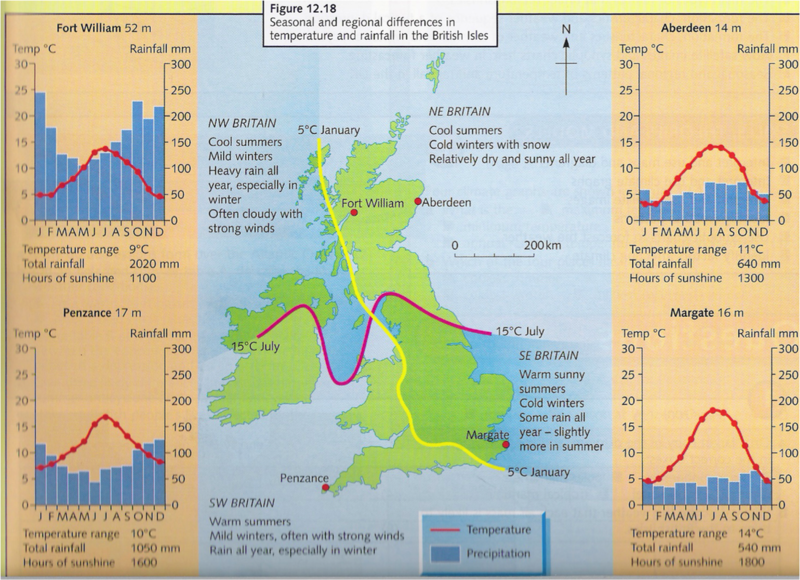 The takeaway point is that the major concentrations of Iron Age hillforts maps the regions of the British Isles most suitable to pastoral agriculture. * There's another great letter in Sargon's archives from a governor along the Urartan border, reporting that he has had to send his personal guard up river across the border to cut lumber for the construction of Dur-Shurrakin, and that he is concerned that he may have caused an international incident. It's an interesting counterpoint to bombastic Assyrian official propaganda to find a governor so solicitous of relations with the dominant power of the Armenian uplands, and, specifically, with his opposite number across the frontier. It's also another illustration of the local governors' inability to mobilise labour for the projects assigned them. I was surprised to see such a well-defined pattern, too. The hillforts in Ayrshire and the southeast suggest that it is mainly up-and-in Scotland that's not good hillfort country --but the way that the border pops out is amazing. Whereas in the southeast people the don't erect "marsh forts." I guess it's not rocket science --it's those heavy-soiled bottoms. And, yes, it grows Tories, although I'd always assumed that that was the whole "born on third base, thinks he hit a triple," or whatever the cricket equivalent is. Is there a cricket equivalent? Can you say it in English? Not just the south-east; I was thinking of the hillfort-rich south-centre and south-west. On the language point, "flat-track bully" is pretty good - i.e. one who scores hugely but only under easy circumstances and therefore has an inflated reputation?